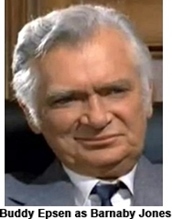 Barnaby Jones (Buddy Epsen) was a private investigator who had retired turning his detective agency over to his son. When his son is murdered Barnaby comes out of retirement to find his killer. After he solves that crime he finds that he wants to continue working so he enlists the help of his now widowed daughter-in-law Betty Jones (Lee Meriwether). Together they fight crime and solve cases that the police haven’t been able to. 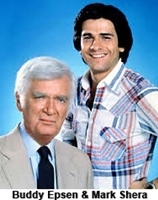 A couple of seasons later a distant cousin J.R. Jones (Mark Shera) is looking for his Father’s murderer. After Barnaby solves that case as well, J.R. stays on and helps with the detective work. They also had a fairly complete laboratory where they could examine evidence to look for clues. This series was pretty popular even if it wasn’t very deep. The crimes were usually not too hard for the viewer to figure out and given Epsen’s age there wasn’t much in the way of fist fights or action. When Mark Shera is added to the cast the action does pick up a bit. Jones is not your typical P.I. He drinks milk whenever he can get it (even ordering it at bars), he definitely is not a chick magnet and as I already mentioned he’s not really into punching his way to the truth. This was the allure of this crime drama, that an ordinary guy (a senior at that) could simply outsmart the bad guys without driving a Ferreri or shooting up the town. The last couple of seasons Epsen, who by then is in his seventies, decides that the rigors of starring in a weekly television series are a bit to much. To accommodate him the producers expanded the roles of Meriwether and Shera reducing Epsen’s work load by half. 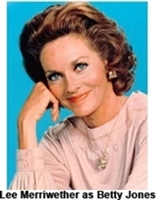 Lee Meriwether started her career as a model and beauty pageant contestant. 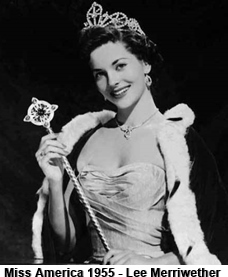 She won the titles of Miss San Francisco and Miss California before winning the coveted title of Miss America in 1955. After her one year reign she became a “Today Girl” on NBC’s The Today Show in 1956.